It’s Friday, Dad’s late, and it’s kids day, which means they get to select the menu. Not surprisingly, it is spaghetti. This is easy to make, they like it – I don’t complain. The babies however, rate a little extra nutrition. Besides they’re young and will usually eat what they are given. to the table, crawled over his high chair and onto the table, much to the delight of the other four. 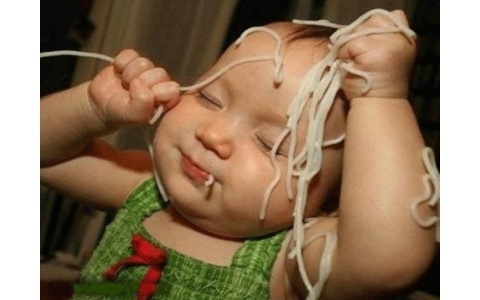 When he put his hand smack into one of their spaghetti-strewn plates, their delight knew no bounds. I put him back, tied him down with his high chair belt, my apron, and a rope from the closet, and delivered the avocado. His brother Stanley began eating his. Eddie investigated his avocado’s green interior. Turning my back for a moment, I whipped up a sensible, sneaky dessert, mixing tofu, yogurt and my strawberry preserves together. The kids would get that protein and calcium if the cook had her way. the high chairs with the perverted hope that they too would be slimed. Shooing the reluctant would be slime-ees back to their places, I looked over to find that Eddie had magically finished most of his avocado. I was surprised and checked the floor. It was awful, but among the mess of spaghetti, crackers and UFO’s(unidentified food objects), there was no avocado. “Good boy!” I praised. He smiled a very green smile and waved an equally green and slimy hand. Stanley meanwhile was trying to reach his sister’s spaghetti and was yelling very loudly, so he was given some. He did, after all, eat the avocado. A one year old does interesting things with a strand of spaghetti. It is held across the nose, over the head, and finally bitten in the middle. Alex, who had his dessert now, offered to demonstrate how eating pudding can be, if done properly, just like listening to a machine gun. The yogurt-tofu proved to be a hit, with seconds all around. My joy was only mildly curtailed by the sight of Eddie standing up in his chair like a gopher, having Samson-like snapped all his chains. He was covered now with avocado and pudding and was trying hard to imitate his older brother’s machine gun rendition. He succeeded in covering his twin with a fine green and white spray, which settled around Stanley’s little spaghetti goatee. missing avocado. It was tucked securely in Eddie’ pants. I’m laughing out of one side of my mouth at the image you’ve created here – I can just see it in all its mucky food-mired wallowing chaos. And out of the other side of my mouth I’m weeping with all the challenge and extra work for you that came with your abundance of children. Bless you, Faye, for your sense of humour and for your sanity-retaining strategy of recording these stories. It’s our gain.